The most effective piece of signage is the one people can see, which makes vehicle signage one of the best investments you can make for your business! Wherever you go, you can be sure people are seeing your mobile sign. When it comes to visual impressions, no billboard or static sign can come close! Magnets and vehicle wraps in Lincoln, NE are also eye-catching and alluring. When your car pulls up next to someone in traffic or is parked outside for all to see, it’s hard to ignore the sign on the side or the message wrap on its body. And, when these advertising mediums have a message that’s interesting, you can bet people will want to check them out. For those looking for a low-cost, high-reward marketing investment, a vehicle magnet is a great idea. Magnets have the benefit of being removable and moveable, meaning you can put them anywhere you want on your vehicle and take them off whenever you don’t want to display your message. They’re also non-invasive, meaning they won’t harm your vehicle and they can be manipulated by you without any professional intervention. We offer magnets of all sizes and styles—some large enough to cover your entire door panel and others small enough to be a bumper decoration! Though it’s more expensive than a magnet, a vehicle wrapping service in Lincoln, NE is undeniably more alluring and captivating. It’s hard not to look at a vehicle-wrapped car heading down the road and the message is instantly clear to onlookers. The number of colors and styles available for vehicle wrapping is infinite, and through the exceptional graphic design services we offer at Here's Your Sign Screen Printing & Designs, we guarantee a vehicle wrap that’s undeniably brilliant. 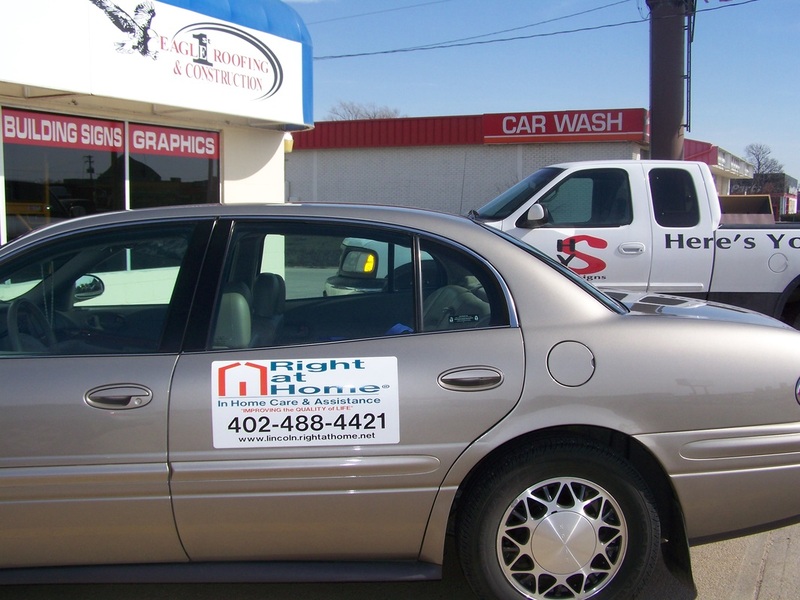 For more information about magnets and vehicle wraps, we invite you to consult with our experienced team by calling 402-217-5212.